Eat Drink & Be Merry and Scuba Books Worth Looking At are just a couple of Sunken Treasure Scuba Center's blogs. Place the pineapple chunks, mango slices, passion fruit concentrate, lime juice and sugar in a blender. Mix until smooth. Add the tequila, orange liqueur, and plenty of ice. Blend until the ice is crushed and smooth, the margarita should have a creamy slushy consistency. Adjust the amount of ice based on the consistency you prefer. Moisten the rims of the glasses with a slice of lime and garnish the rims with sugar according to your preference. Serve the cocktails immediately garnished with fresh passion fruit pulp, pineapple slices, and/or lime slices. Combine mayonnaise, yogurt and chili powder in a small bowl. Grill corn, turning occasionally, until marked and tender, 8 to 12 minutes total. Spread each ear with 1 tablespoon of the sauce and sprinkle with 1 tablespoon Cotija (or Parmesan). Serve with lime wedges. Shopping tip: Cotija cheese, also called queso añejo or queso añejado, is an aged Mexican cheese similar in texture and flavor to Parmesan. Find it near other specialty cheeses or in Mexican grocery stores. Combine milk, egg yolks, and lime juice. Blend until smooth. Pour filling into pie crust and bake for 15 minutes. Allow to stand 10 minutes before refrigerating. To serve, top with freshly whipped cream or meringue, and garnish with lime slices. This recipe is made available as a courtesy by Nellie and Joe's Famous Keylime Juice. Margarita is also called a Moonlight Margarita or an Electric Margarita, but they are all essentially the same. This drink is a simple twist on the classic margarita cocktail. It is perfect served on the rocks or as a frozen drink, plus this margarita recipe can also be made by the glass or by the pitcher. This is one super drink that will have everyone asking for more. For the frozen version simply replace the shaker with a blender and blend to your desired consistency. To reduce the calorie count a bit substitute 2 packets of Splenda for the sugar. Serve with a few pineapple slices. In a saucepan, combine sugar, cocoa and salt. Add water and bring to a boil. Cook and stir for 2 minutes. Stir in milk; heat to serving temperature. Make sure not to boil…we don’t want to burn those little tongues. Remove from the heat; stir in vanilla. Whisk until frothy. Place the cream cheese & pecans together in a food processor. Pulse until the pecans are well combined with the cream cheese. Add the pineapple & pulse until thoroughly combined. Add the scallions & jalapeño, again pulsing until well combined & smooth. This is a great make-ahead dip & is tastiest if refrigerated overnight so the flavors can meld. The easiest way to drain pineapple is to pour the crushed pineapple in a mesh strainer...save the drained juice for your favorite cocktail/mocktail! At the award-winning Greenhouse Tavern in Cleveland, lead bartender Dave Taha has created the ultimate holiday tipple that tastes good with or without booze. “This one reminds me of Christmas at Grandma and Grandpa’s,” says Taha. “The fresh ginger gives it a bit of zing, and the tart cherry adds depth and balance, while the allspice and nutmeg lend their holiday spirit.” Whether you decide to drink it clean or spiked, it’s surely going to get you in the festive spirit. Combine all of the ingredients except for the ginger ale and nutmeg in shaker with ice and shake. Strain into rocks glass over ice, and top with the ginger ale. Gently stir, and garnish with ground ginger. *Items can be found at Asian markets. Place oil in a small frying pan and heat oil until hot. Place one wonton wrapper in at a time. Cook briefly until it starts to bubble (approximately 10 seconds). Turn over and cook another 10 seconds. Remove and drain on kitchen towel. Put wasabi mayonnaise into a squeeze bottle and set aside. Combine sweet soy sauce, sweet chili sauce and soy sauce together in a bowl and set aside. Spray skillet with non-stick cooking spray. Cook lionfish fillets in skillet over medium-high heat for 2 to 3 minutes, until flaky and tender. Cut or flake lionfish so it is in small pieces. Toss lionfish in soy sauce mixture. 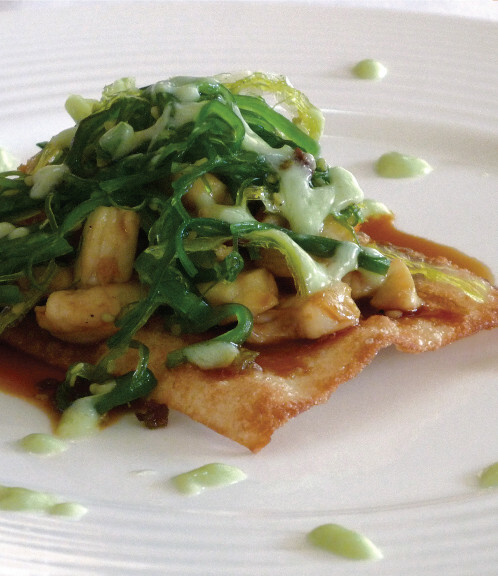 Place lionfish on wonton wrappers, top with seaweed salad and drizzle with wasabi mayonnaise. 1. Mix sugar and cornstarch in large bowl until it resembles powder. 2. Add the light cream slowly in a steady stream, whisking constantly. Beat well. 3. Add milk in the same way. Beat in egg yolks. 4. Pour into heavy 2-quart saucepan, set over medium high heat, and bring to boil, stirring constantly. 5. When the mixture reaches a hard boil (when bubbles continue thru stirring) reduce heat to low, and simmer for 2 minutes while continuing to stir. 6. Pour the filling into medium size bowl. Beat in the butter one Tablespoon at a time, stirring each until melted. 7. Beat in vanilla and coconut. Cover the surface with plastic wrap and let cool for 1/2 hour. Spoon filling into pie crust, chill until firm, at least 4 hours. Can decorate with whipped cream and browned coconut if so desired. Blend the pineapple, juice and sugar together until you have a smooth puree. To make the cocktail, combine the pineapple puree, rum, mint and lemon/lime and passion fruit in a jug then muddle together. Pour a little of the pineapple mixture in the bottom of 4 glasses, add ice then top with soda water. Add fresh mint and a few slices of lemon and serve. Spread Margaritaville Calypso Rub onto plate and press each side fo chicken breast into rub to season. Heat large skillet over high heat, add oil and cook 2 minutes on each side or until internal temperature reaches 165 degrees F using an instant-read thermometer. Chop chicken. Spread flour or cornmeal on a clean flat surface and stretch pizza dough into a pizza shape over it. Put pizza on a cookie sheet or pizza pan. Sprinkle chopped chicken, Margaritaville Mango Salsa, cheese and green onions over pizza dough. Back 12 to 15 minutes, until crisp and bubbly brown on top. Shake the rums, Kahlúa, lemon juice, and pineapple juice with ice then strain over crushed ice into a chilled glass. Garnish with a pineapple wedge or orange slice and a maraschino cherry. Place guacamole in mixing bowl. Add pineapple, bacon, and red bell pepper to mixing bowl and fold into guacamole carefully. Place guacamole on center of plate. Place additional Tbsp of diced pineapple on one side of guacamole for taste & aesthetics. Place lemon wedge on other side of guacamole. Squeeze the lemon on guacamole before eating. "This is an easy way to spice up regular hot chocolate mix. Add more or less of each ingredient, depending on taste. Serve with marshmallows or whipped cream and enjoy." Muddle the mint leaves and lime juice in a glass, add brown sugar, then ice. Next, add watermelon cubes, then pour rum and soda and serve with a garnish of mint or lime. If you want something really fancy, nothing is showier than a Miami Vice; part piña colada, part daiquiri and all Bahamian. Twin Brothers, a popular restaurant at the Fish Fry (Arawak Cay) on West Bay St usually serves this drink as a virgin but it can easily be spiked with rum. The two parts can be prepared beforehand and combined when served. Blend both parts separately with ice until smooth. Fill a stemmed cocktail glass with the white piña colada mixture and then add the strawberry daiquiri mixture on top. Decorate with a maraschino cherry. Straight from the popular beach bar on Grand Cayman, Royal Palms delicious tropical drinks like this one are served nightly. Mix first 6 ingredients in a blender with ice. Pour in tall glass. Add a Myer's Rum floater on top and enjoy! Grill over medium-high heat until cooked, about 2-3 minutes per side. This recipe uses pre-made or store-bought jerk seasoning. Get it in the ethnic isle of your local supermarket or make it from scratch.